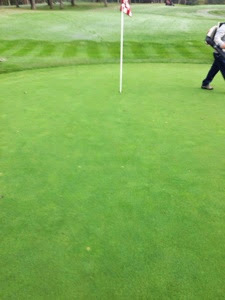 After 21 days all greens are fully recovered and roll smooth. 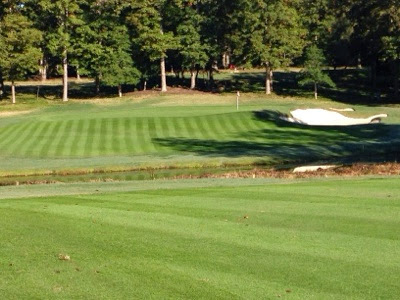 Growth regulators have been applied and rolling will continue several times a week through the fall golfing season. 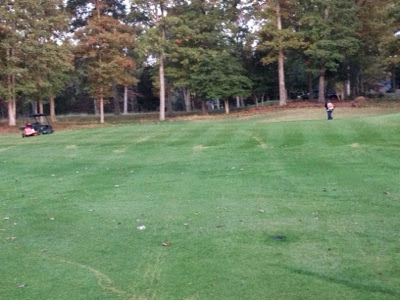 You should except very fast greens through out the remainder or the year. 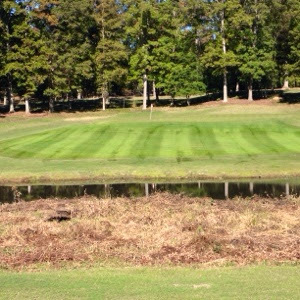 The rye grass has come up well and mowing hieghts are set for the winter management. The second application of fertilizer will be applied next week. We will also go out with the follow up rye grass application in two weeks. This is a lighter rate. 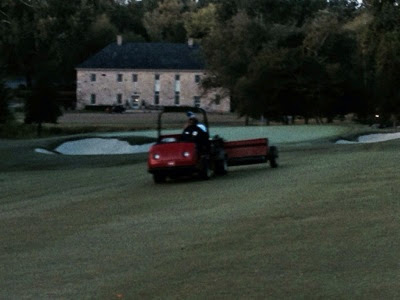 We do this to fix any skips or thin areas in the fairways. 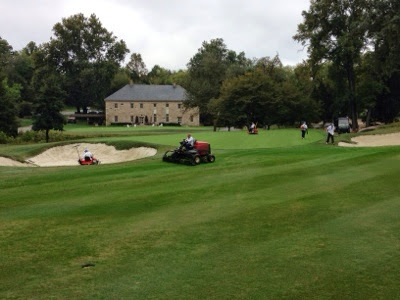 Today we are mowing the ryegrass for the first time. It has been 10 days since we planted the seed. We will manage the rye at a height of 5/8 of an inch. 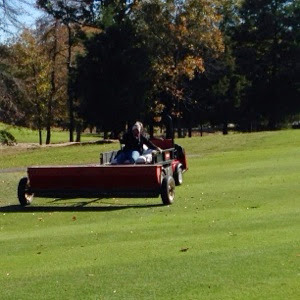 This will allow the Bermuda grass some extra protection and give the rye some time to mature before the really cold weather arrives. 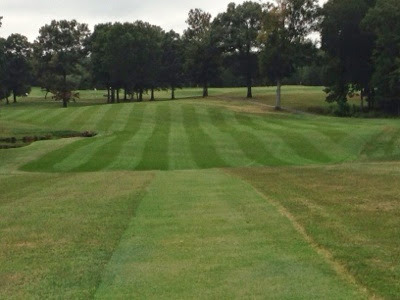 Fertilizer will be a applied in small amounts every 10-14 days. We will also do another light seeding in another couple of weeks. This will allow us to fix any skips or thin areas. 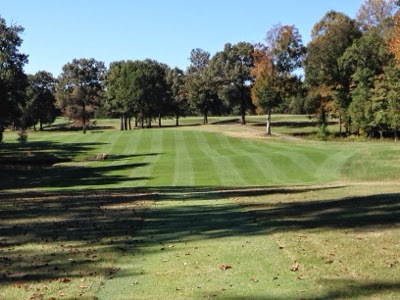 Here is 18 fairway after being mowed the first time after seeding. 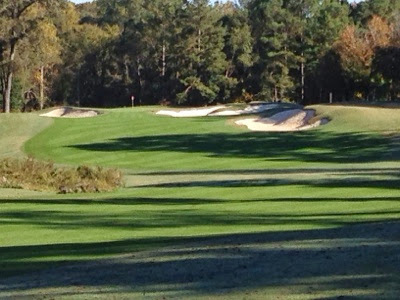 Should make for good fall,winter spring playing conditions. 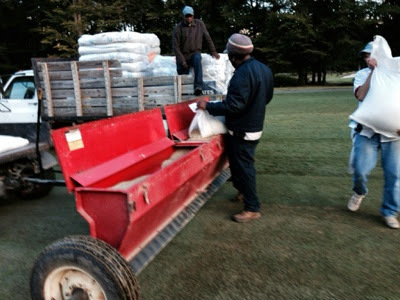 William is loading the spreader with rye grass. The spreader holds 400 lbs. 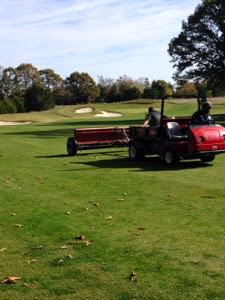 We are seeding fairways at a rate of 325 lbs/acre.